Unless there are interior finishes, furnishings, or materials that require protection earlier in the schedule, the finished roofing is the last step in the close-in process. 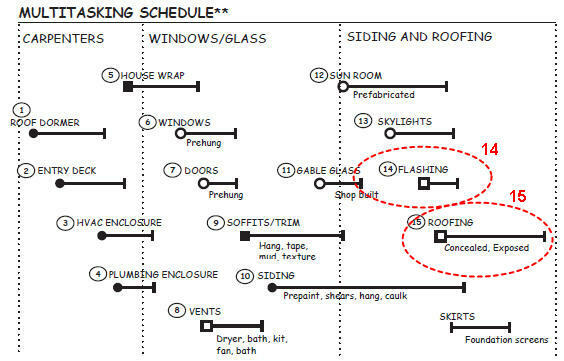 Timing depends on when mechanical and electrical rough-in is scheduled, since roof and wall penetrations are often necessary for vents, intake, and outflow lines that extend through the roof from the walls and ceilings. A professional roofing contractor begins work by setting up the site and the rooftop for the work. This includes the installation of toe boards, chicken ladders on steep slope roofs, and tie off points for personal fall protection. Local building codes do not specify safety procedures for roofing contractors, but the United States Department of Labor, Occupational Safety & Health Administration requires fall protection on residential roofs for employees working six or more feet above a lower level (See Fall Protection in Residential Construction). The flashing for metal roofs with concealed fasteners is an integral part of the roofing system and installed with proprietary methods, tools, and clips to ensure a secure seal. 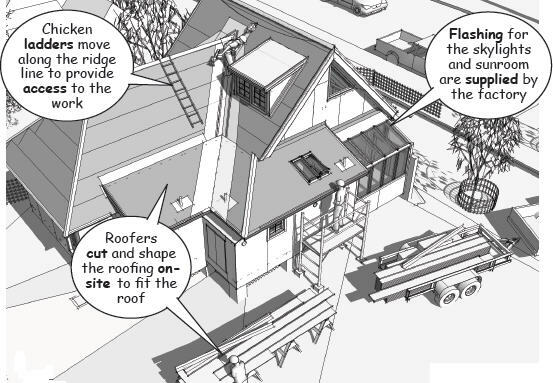 Note that the roofing contractor will coordinate their work with the other trades to fit siding, trim, and other exterior finish materials over or under the roof flashing. See the Metal Roofing Alliance website for information on different types of metal roofing, detailed specifications, and expert advice. A galvanized metal roof with concealed fasteners provides a seamless seal against moisture penetration, reducing energy costs and providing a much longer life cycle than other types of roofing. Color choices depend on climate and site conditions, white is the most reflective, while darker colors will absorb more solar energy. The concealed fasteners anchor the metal panels to roof sheathing or furring strips depending on insulation requirements and local conditions. 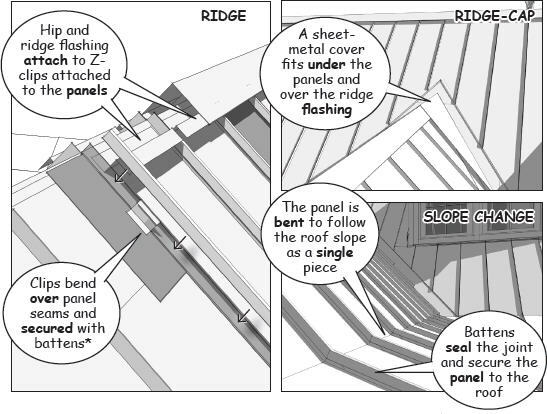 The clips are screwed to the roof structure with tabs that bend over the panel edges, and are snapped to battens extruded in the panels. Once snapped into place, the roofing system is secure against wind loads, icing, and other weather related problems. 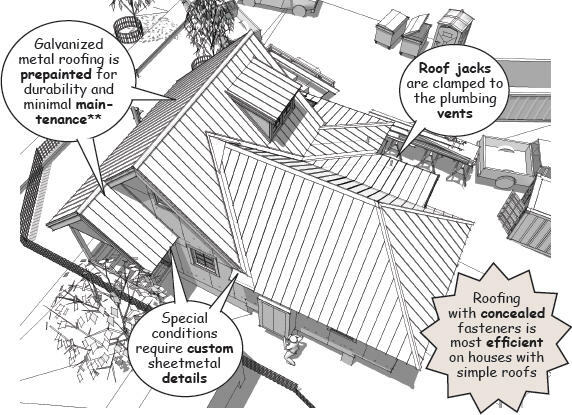 The installation of metal roofing is most efficient on houses with simple roofs, but there are a variety of special pieces that can be used to accommodate almost any configuration when the system is installed by a professional roofing contractor.